`What have you done?’ Holmes asked. Sherlock Holmes shook his fists in the air. `Idiots! Fools!’ he cried. Again Holmes got angry. `Why did you not come to me at once?’ he cried. ‘We should call the police,’ I said. ‘And be laughed at? No, I will do nothing,’ my father said. ‘I did not argue with him because he was a very stubborn man at times. But I went about with a very heavy heart after that.’ John Openshaw stopped talking and warmed his hands at the fire. Then he continued. John Openshaw stopped talking and took out a letter from his pocket. 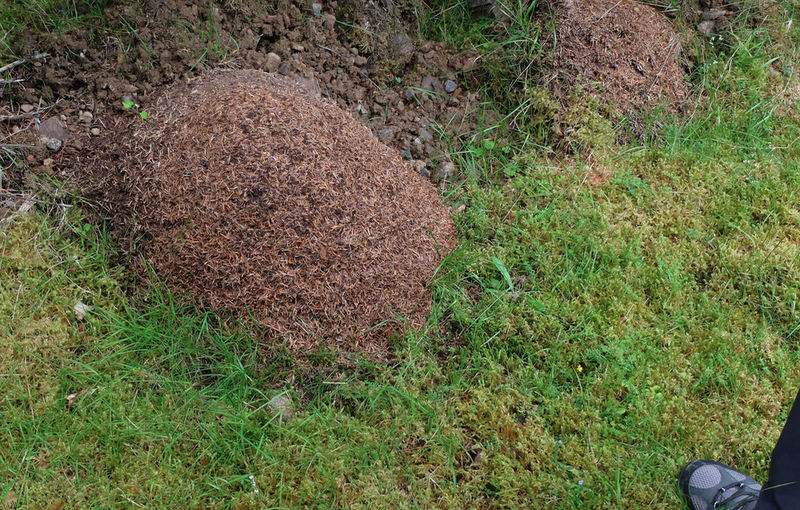 From the letter he shook out five little orange pips. John Openshaw continued with his story. John Openshaw paused; then continued. `It was the beginning of 1884 when my father came to live at Horsham. Everything went well – until the January of ’85. On January 4th – just after the New Year – my father gave a cry of surprise. We were at the kitchen table eating breakfast. I looked at my father. He had a newly-opened letter in one hand. In his other hand, there were five orange pips. My father always scoffed at my story about my uncle. But now he looked scared. `What does this mean?’ he asked. My heart turned cold. `It’s K.K.K.,’ I replied. `What papers? What sundial?’ my father asked. ‘I do not want to take up any more of your time Mr Holmes,’ said John Openshaw, `so I will tell you what happened to my uncle.’ He paused and started his story again. ‘One night, my uncle left his room and never came back. We went to look for him and found him at the bottom of the garden. He was lying face down in a dirty pool of green water. There was no sign of a fight or any violence, and the water was only two feet deep. The police said it was suicide. But I knew my uncle and knew that wasn’t true. No one listened. My father inherited my uncle’s estate and got a sum of money – £14000, which lay in my uncle’s name in the bank. Walter and Scott wish you a Merry Christmas and a very happy New Year. Their adaptation of The Five Orange Pips will continue in early January. My grandfather had two sons – my uncle Elias and my father, Joseph. My father had a small business in Coventry. He invented a tyre that didn’t puncture. It was very successful. Eventually, he sold the business and retired. When he was a young man, my uncle Elias went to Florida and bought a plantation. He did very well. Then war broke out between the North and the South. He fought for Jackson’s army and later for Hood. He became a colonel. When General Lee stopped fighting, my uncle went back to his plantation and worked there for another three or four years. He grew rich. Around 1867 or 1868, he came back to Europe and bought a small piece of land in Sussex, near Horsham. He was a single man, fierce and quick-tempered. But he mostly kept himself to himself. I don’t think he ever visited Horsham. He had a garden with two or three fields around his house. Sometimes, he stayed in his room, smoked heavily, and refused see anyone. Even his own brother. John Openshaw stopped talking and looked into the fire. A man entered. He was young and well-dressed. But his raincoat was wet, and the umbrella in his hand dripped water. He looked nervous: his face was pale and his eyes were heavy and tired. `There is clay and chalk on your shoes. It is quite distinctive,’ said Holmes. `I have come for advice,’ said the man. `I can give that easily,’ said Holmes. The story begins in September, 1887. That day, the wind screamed and the rain beat against the windows. That night, the wind grew stronger. Sometimes it sounded like a wild animal in a cage, and sometimes it cried down the chimney like a sobbing child. As usual, Sherlock Holmes was in his chair beside the fire. He was reading, and I was sitting across from him, reading too. My wife was visiting her mother. Once again, I was back at my old place, that famous house on Baker Street. ‘If so, it must be a serious case,’ said Holmes. ‘Why else come here on a dismal night like tonight? But I think it might be a visitor for our landlady,’ said Holmes, and he began reading again. But Holmes was wrong. Soon, we heard footsteps. They came up the stairs. Then there was a chap at our living room door. Starting next week, we will serialise A Sherlock Holmes adventured called The Five Orange Pips. It will be for intermediate students. Happy reading! Today is a long walk, the longest of the trip. The distance from Drumnadrochit to Inverness is 29km. After a lovely breakfast with excellent coffee, we say goodbye to the owners of Kilmore farmhouse, Colin and Frances, and start walking. We are lucky again: the weather is sunny, but not too warm.Soon, we are on the hills. The highest point of the walk is 380m high. It’s not much, but there are lovely views everywhere. After about 15km, we see signs for a café. We follow them and they lead to a campsite. The campsite offers tea and food. 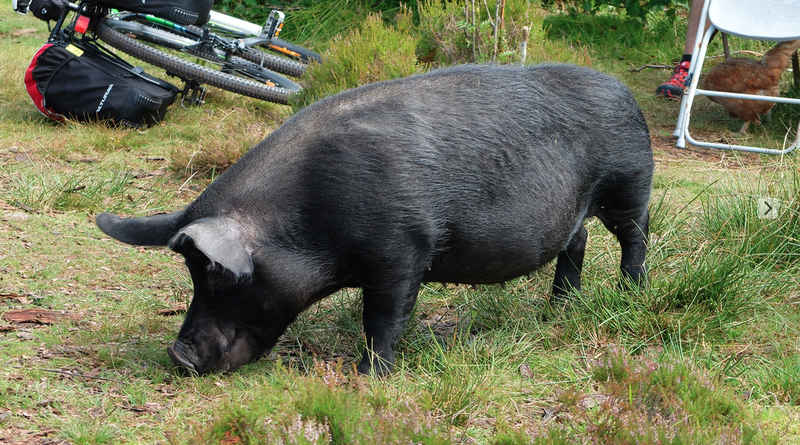 We rest for a while and watch a large, black pig wander freely. After our rest, we continue walking. 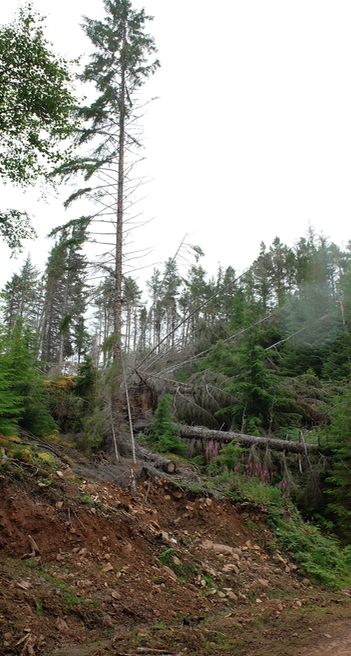 Again, we pass so many fallen trees. 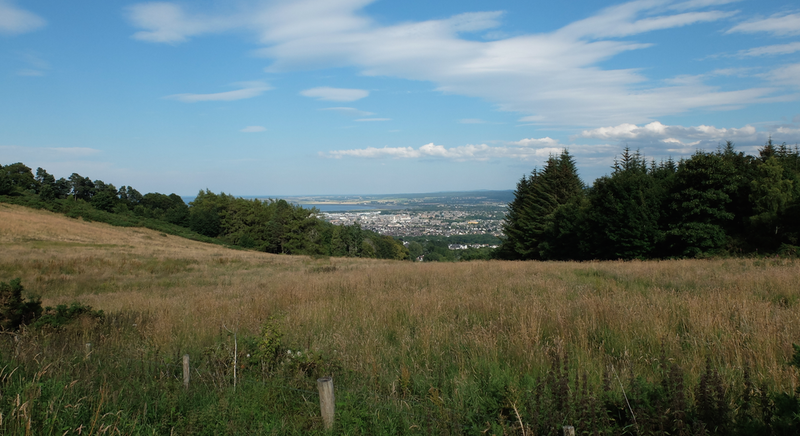 Soon, we see Inverness in the distance. We walk towards the town and enter the grounds of an old hospital. 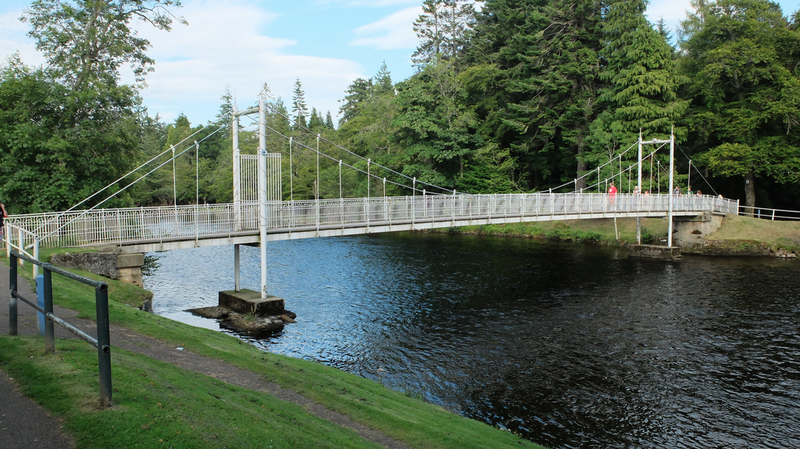 After that, we cross the River Ness on a beautiful suspension bridge. Then we see Inverness castle, and we are happy. 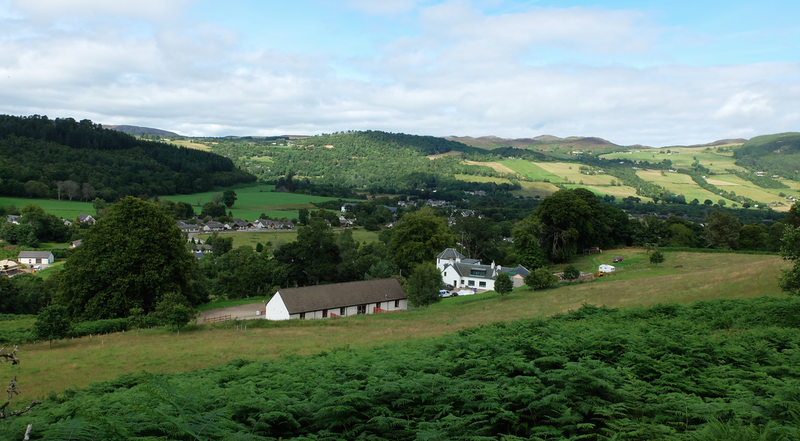 We have walked the Great Glen Way. When Nunez thought of the blind world in the valley below, he knew that it was not his world. He thought about turning around, about looking down at it one last time. But he didn’t. He kept his eyes on the snow and ice and kept climbing. He thought of home and the world beyond the mountains. His world. He thought of all the towns and villages with their houses and busy streets. He thought of the countryside with its rivers that ran all the way to the sea. The sea – its endless waves, its sandy islands. And ships! Ships out at sea on journeys around the greater world. When sunset came, he was high above the valley. His clothes were torn and his body was covered with blood. All around him, mountain peaks rose into the vast and darkening sky. It was a truly beautiful evening. He lay on the bare earth with the smile on his face. ‘I have escaped from the Country of the Blind, the place where I wanted to be king,’ he said to himself. When the cold night came, Nunez slept peacefully; a content man under the stars. For a week before the operation, Nunez did not sleep. Day after day, others in the village slept, but he walked about in the bright sunlight and thought about the operation. Then at last, the day before the operation came. He spent a few minutes with Medina-Sarote before she went to bed. Nunez felt nothing but pity – for himself and for her. He held her in his arms, kissed her, and looked into her sweet face. `Goodbye,’ he said. Then in silence, he turned away. Medina- Sarote could hear his footsteps as they retreated. Something in their sound made her cry. Nunez wanted to be alone. There was a quiet place in the meadows, a place with thick green grass and narcissus flowers. He went and lay down. ‘I will stay here until it is time,’ he thought. Then he fell asleep. When morning came, Nunez lifted his eyes to the rising sun. It rose above the mountains. ‘It is the most beautiful thing I have ever seen,’ he thought. Nunez got up and started to walk. It was a new day, it was his last day of sight, and there was beauty everywhere. Today is quite a short walking day: only 13km. Before we begin, we have coffee and read the newspaper in Fort Augustus. We look at our map. We have two choices. 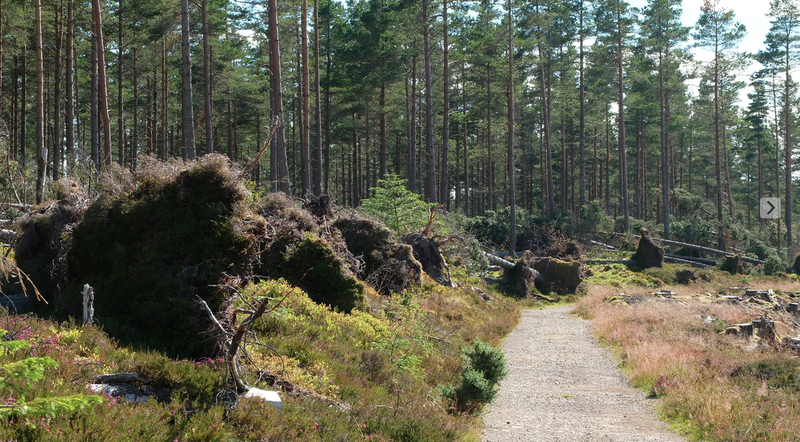 Either we can take a low-level route through the forests to Invermoriston, or we can take a higher-level route. We choose the higher-level one. 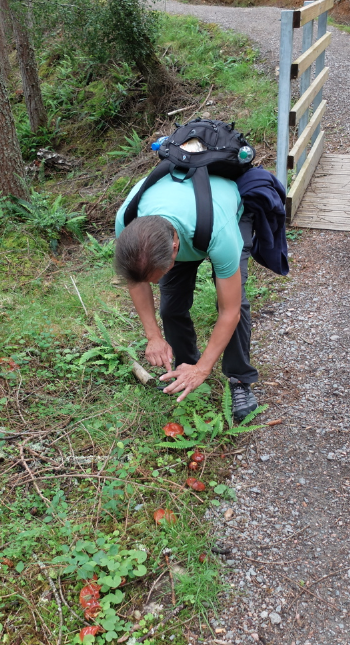 In the forest, we find lots of mushrooms. Some are edible and some are not. 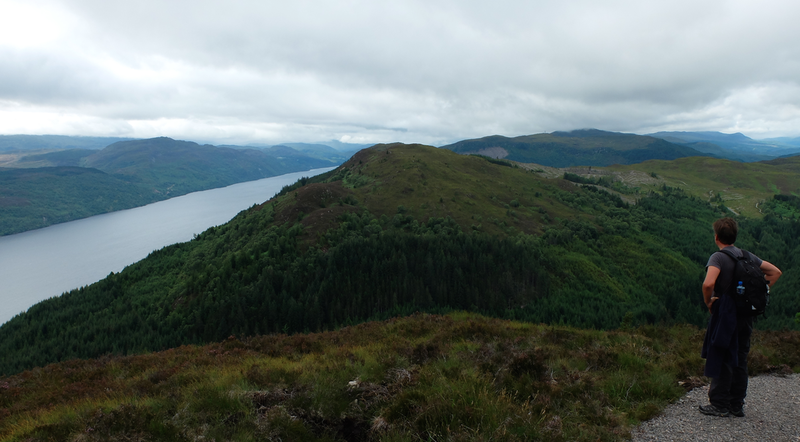 Soon, we leave the forest and are walking across the hillsides with Loch Ness below us. Some people believe that Loch Ness has a monster in it. Today, we can’t see any monsters! Six rivers fill Loch Ness. 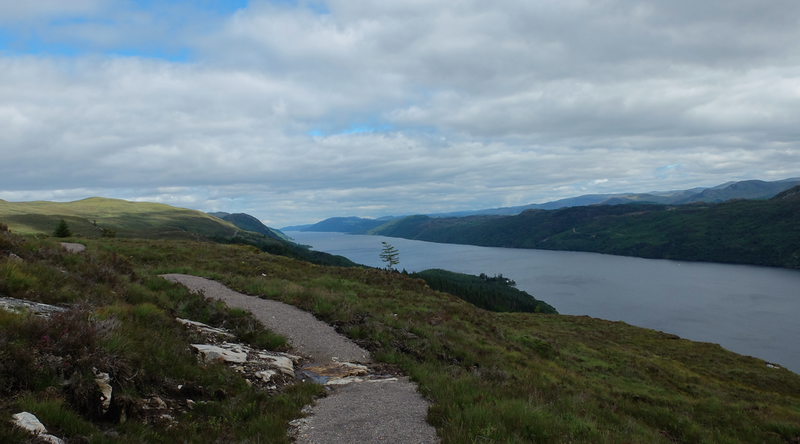 Loch Ness is 37 kilometers long and 230 meters deep in places. The volume of water in it is greater than all the water in all the reservoirs in England and Wales. 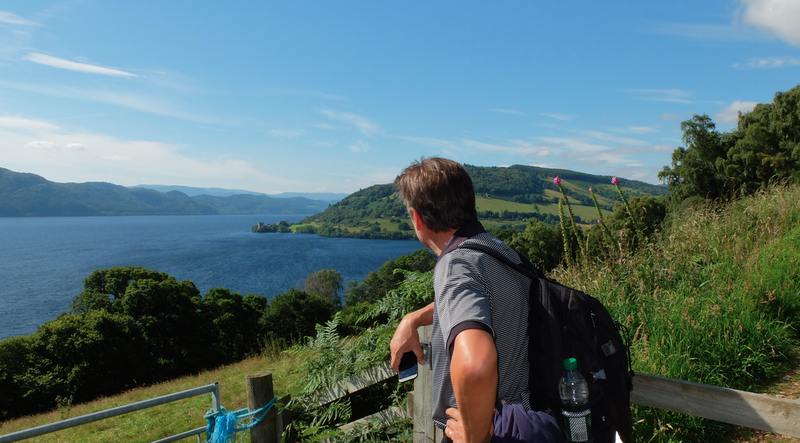 We are enjoying the weather while we admire Loch Ness. It is a perfect day for walking: dry and a little cold. After five or six kilometres, we stop and make tea. 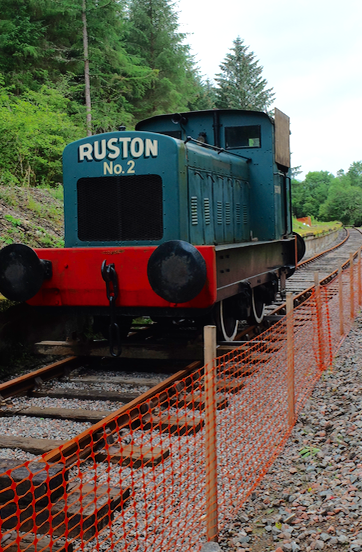 There are special, sheltered places on the hillside for this. 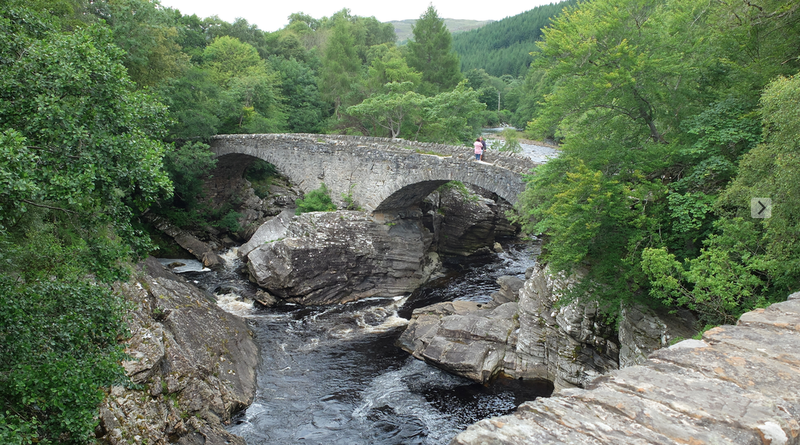 When we come into Invermoriston, the first thing we look at is the old bridge. 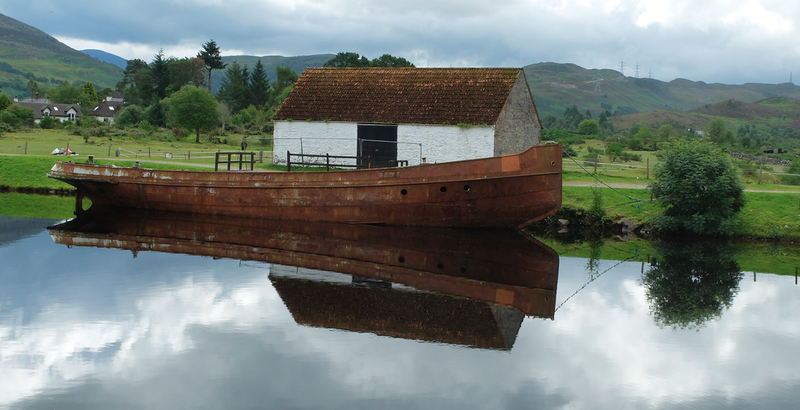 It was built by Thomas Telford, the same man who built the Caledonian Canal. ‘Do you want the doctors to take out my eyes?’ Nunez asked Medina-sarote. ‘Seeing – having sight – is my world,’ he told her. Nunez stopped talking and let her think about the question. He didn’t feel good. ‘You…’ she said and stopped. ‘Please do not say these things,’ said Medina-sarote. Nunez felt angry, but he also felt sympathy for her. It hurt her to say these things to him. He knew that. They sat in silence for a long time. When Nunez finally spoke, he was almost whispering. `If I agreed to this…’ he said. As soon as he spoke, Medina-sarote threw her arms around him. The elders thought for a long time about Nunez. He was a problem, but they wanted to help him. There was a doctor amongst the people of the blind, a medicine man. He was clever and curious. One day the medicine man went to speak to Yacob about Nunez. ‘What is it?’ Jacob asked. Jacob was happy. At once, he went to tell Nunez that the medicine man could cure him. But when he told Nunez, Nunez did not welcome the news. Yacob was angry. `Don’t you care for my daughter?’ he asked. ‘Is she more important than these strange things called eyes? Tell me!’ he said. 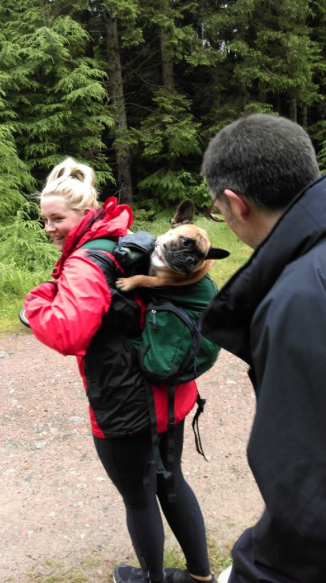 The next morning, Neville takes us back to South Laggan and we start walking again. Today is a shorter walk. It is only 14km. 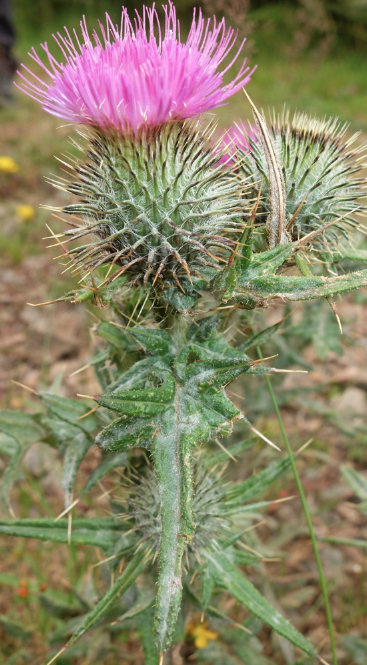 We are walking beside Loch Oich and following an old railway line and one of General Wade’s old military roads. General Wade came to Scotland after the Jacobite rebellion in 1715. 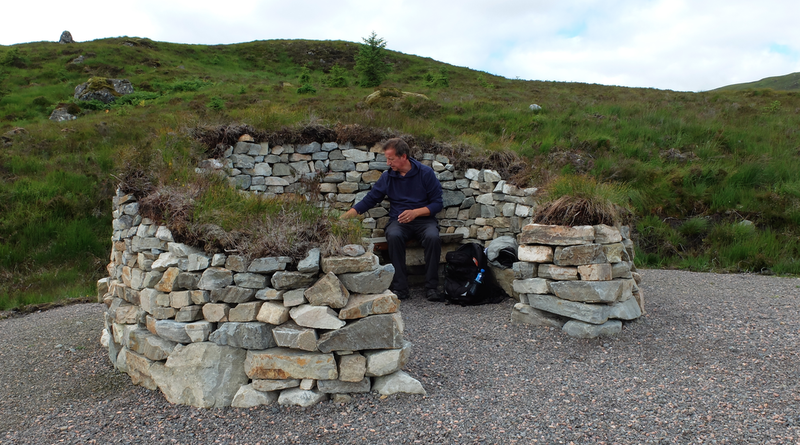 After he built the new roads, it was easier for the British government to send soldiers to the Highlands. In other words, the new roads extended British government control of the north of Scotland. The canal is busy today. 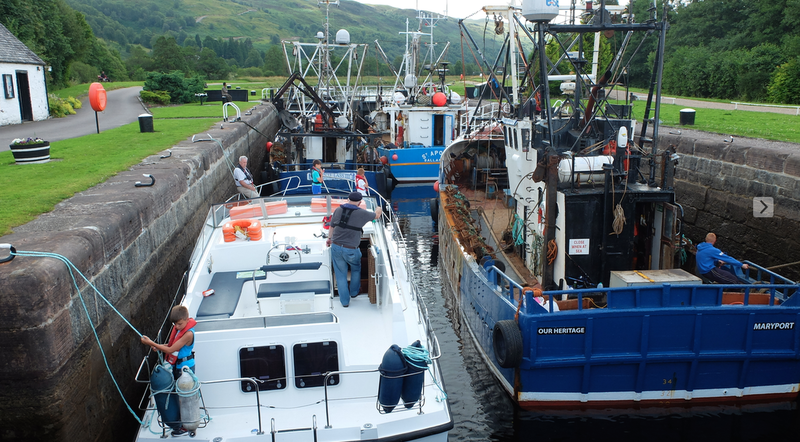 There are lots of boats waiting in its locks. 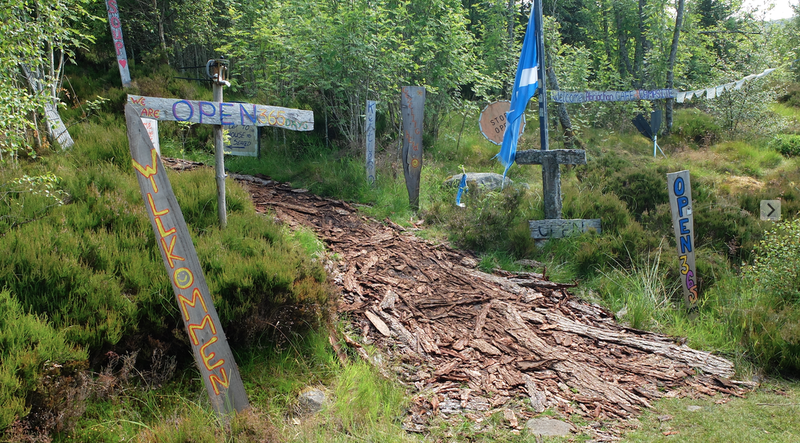 At Bridge of Oich, we stop. It is an unusual bridge. It is made of granite and iron and was built in 1849. Because there was a danger of floods, James Dredge, the bridge’s designer, built a bridge with a single span across the River Oich. He used a cantilever design. The bridge has two separate parts; so if one part falls down, the other should stay up. 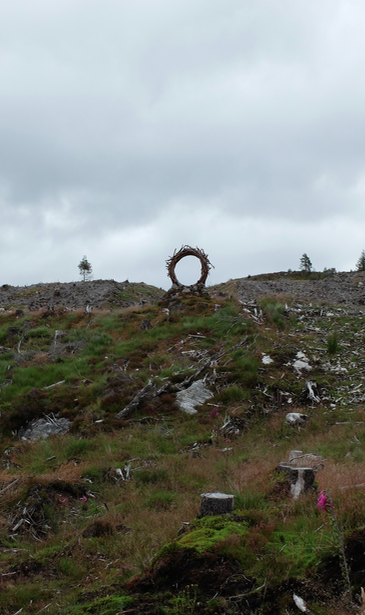 Near Fort Augustus, the sky begins to darken. A few drops of rain fall. But we are lucky again. 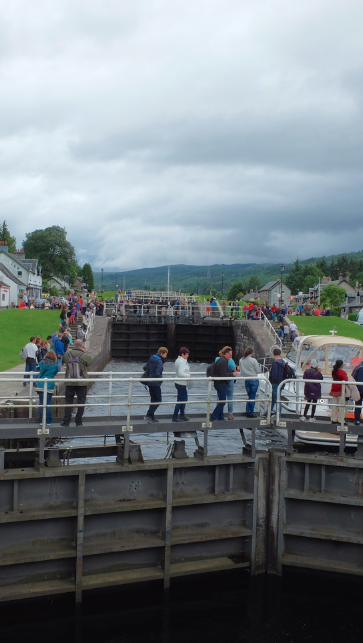 The heavy rain only comes later in the evening when we are indoors.There are five locks near Fort Augustus. Today, many people in the village are using them as bridges to cross from one side of the canal to the other. 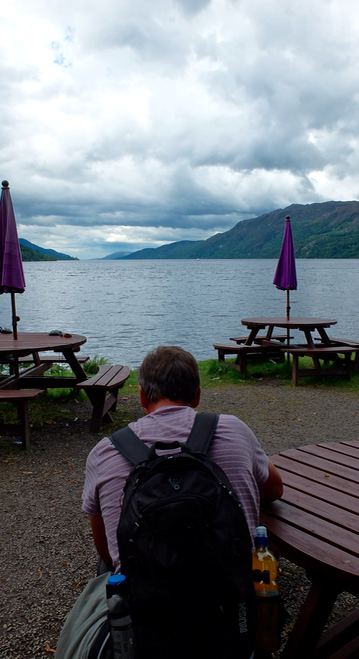 Before we find our accommodation – Sonas bed and breakfast, the home of Jimmy and Lorna Service – we walk through the town and find a seat beside Loch Ness. Our journey starts there tomorrow. 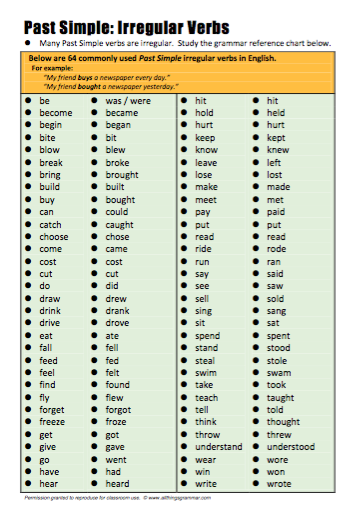 Here is a short recording of some irregular past tense verbs. I’ve used a list provided by Robert Dobie at http://www.allthingsgrammar.com. Great site. After breakfast, Colin drives us back to Gairlochy after we buy some sandwiches and drinks in Spean Bridge. We thank him and begin again. We plan to walk 22km. 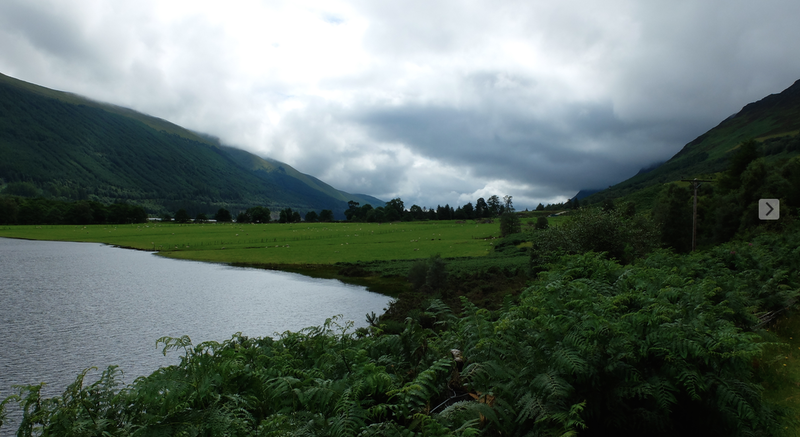 Our route takes us along the north shore of Loch Lochy. The loch’s water is dark grey, the same colour as the sky. Suddenly, something wakes me up. A black thing swoops past my face. I jump up. Was I dreaming? No, there’s a bat in the room! But now it has gone. Where did it go? Then I see it next to the kettle. It has landed and crawled behind the biscuit tin. As carefully as I can, I put a plastic bag over it, open the window more, and gently drop the bat out.